The Maquis is an interesting episode, because it really illustrates the weird place that Star Trek: Deep Space Nine holds in the pantheon. It’s the middle act of an arc designed to play out across the final season of Star Trek: The Next Generation, the second season of Deep Space Nine and into the first year of Star Trek: Voyager. This was all part of gigantic lead-up to Voyager, a way for the producers to generate friction between the regular cast of the show. However, with The Next Generation ending and Voyager being set on the other side of the galaxy, Deep Space Nine wound up stuck with this plot thread. 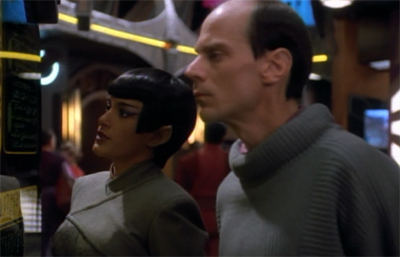 As Michael Piller concedes in The Deep Space Log Book: A Second Season Companion, “DS9 is the true inheritor of the Maquis since there is no long term benefit to Voyager.” And so – despite the fact the Maquis were never intended for the show – they wind up become a perfect vehicle to explore the show’s world view. 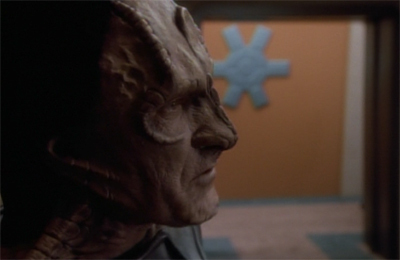 The back story that would lead to the creation the terrorist group was introduced in Journey’s End, broadcast less than a month before The Maquis, Part I. Settlers on planets along the Cardassian border would object to the Federation’s decision to cede the territory to their former enemies. 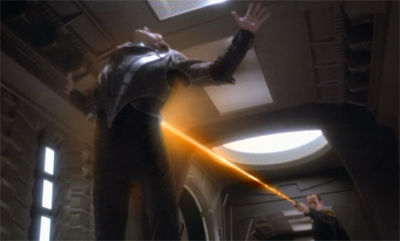 The group would reappear towards less than a month after this episode aired in the penultimate episode of The Next Generation. Of course, the Maquis would also be central to the mythology of Voyager. That show’s first episode, airing less than a year after the Maquis were first introduced, would see a Starfleet crew forced to work with their rebel counterparts when both crews find themselves stranded in the Delta Quadrant. In theory, this would provide amble fuel for ideological conflict, and a nice way of exploring the dysfunction of a crew a long way from home. It didn’t quite work out that way. It’s worth noting that this arc might be the most ambitious narrative the franchise ever attempted. To be fair, it’s a modest undertaking. Nobody who watches The Maquis without seeing Journey’s End will be lost. In fact, Caretaker really tells us all we need to know about the rebels, despite the fact that The Maquis introduces the group’s name and even the Badlands where they seek refuge. There isn’t a clear story woven between these installments, and no obvious chain of dependencies or even structural pay-off. And yet, despite that, it’s still quite an impressive accomplishment. It’s a narrative thread that spans three different television shows across a single year, creating a sense of a truly shared on-screen universe. It’s not that this is first time the franchise has acknowledged the shows co-exist. Guest stars frequently pop from one iteration to the next. Lursa and B’Etor appeared in the second episode of Deep Space Nine, and Blood Oath featured three classic Klingons. Unification teamed up Picard with Spock. Even the space the shows cohabit has been seen to be shared. Picard’s Enterprise has already visited Deep Space Nine twice, in both Emissary (Deep Space Nine) and Birthright (The Next Generation). 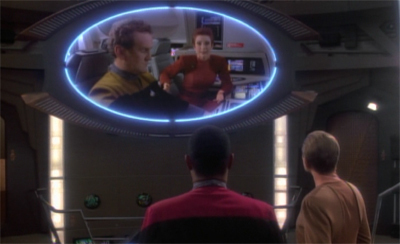 Caretaker would feature Voyager docking at Deep Space Nine before engaging in its pursuit of the Maquis terrorists. However, despite these obvious points of overlaps and nods the fact that the worlds of these shows overlap, there’s something more interesting about Maquis arc. Part of that is probably down to the fact that it doesn’t share any regular cast members. 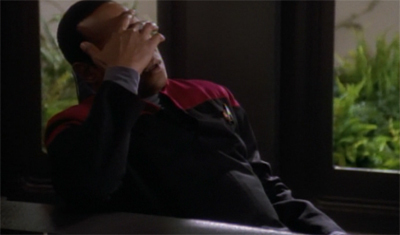 Sisko doesn’t pop over to the Enterprise to help Picard deal with Ro’s defection in Preemptive Strike. Wesley Crusher can’t be spotted in the background of the crowd scenes in The Maquis. Ro Laren is not working on Chakotay’s raider in Caretaker. To be fair, there are a couple of recurring guest stars associated with the arc. Gul Evek pops up here, and Admiral Nechayev will visit the station in the second half. However, this isn’t about stressing how cool it is that the crews might team up to solve a common problem. Rather, what’s interesting is that it acknowledges that a common problem exists. It’s confirmation that the casts of the franchise all swim in the same water, and a big enough stone is going to cause ripples that each will notice in turn. After all, the Maquis represent something different to each of the three shows. They are the end of The Next Generation. Tellingly, the two Next Generation episodes focusing on the conflict see the departure of two of the show’s recurring guest characters. Wesley Crusher and Ro Laren choose their own paths in Journey’s End and Preemptive Strike, and those paths take them away from the Federation. The Maquis represent an end to the sort of idealised world view of The Next Generation, the realisation that maybe this future isn’t as clear-cut as Picard and his crew might like to think. There’s more than just Starfleet out there. They are the beginning of Voyager. They are built into the show’s premise, the fabric of its DNA. The fact that the writing staff promptly ignored and overlooked that premise in order to do their impression of The Next Generation is beside the point. The Maquis are essential to the basic premise of Voyager, but ironically are discarded almost immediately. After all, how can these characters be of long-term use to a show set in the Delta Quadrant? Which, of course, puts them in a bit of a strange position where Deep Space Nine is concerned. 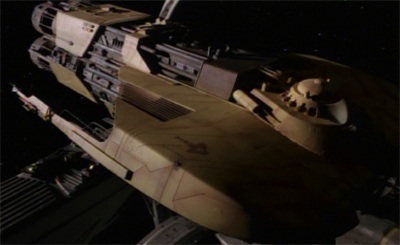 As Ronald D. Moore notes, the Maquis were explicitly created for Voyager, even though the show would do very little with them. The Next Generation was ended, so there’d be little development or resolution there. So Deep Space Nine almost got stuck with the Maquis by default. The curious middle-child of nineties Star Trek, the show had a wonderful habit of picking up loose ends and discarded characters and plot points, only to make them its own. After all, the show would add the first major on-screen Klingon character in the franchise to its recurring cast, would feature the only two members of another Star Trek cast to join the main ensemble of a spin-off and would even find use for William Riker’s transporter duplicate from way back in Second Chances. Deep Space Nine had a habit of picking up those discarded story materials and skilfully incorporating them into its own structure. 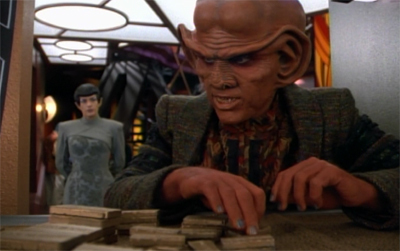 It’s lucky, then, that the Maquis fit the world view of Deep Space Nine surprisingly well. More than any other Star Trek show, Deep Space Nine is built on the idea of questioning and probing this futuristic utopia – challenging the assertion that mankind can create paradise in the twenty-fourth century where everybody gets what they want. The Maquis are notable for being a break-away fraction from the Federation, rebels and terrorists fighting to protect the homes given up by the Federation as a means of ensuring galactic peace. Peace is – as a necessity – often built on compromise, and compromise means that not everybody can have what they want. The second season of Deep Space Nine is firmly anchored in the American experience of the late nineties. In fact, the show’s entire attitude towards the Federation seems to exist within a post-Cold War framework. With the threat of a powerful enemy galvanising the nation, it’s less fashionable to be introspective or questioning. With the collapse of the Soviet Union, and the decline of a rival that had provided a convenient way for the United States to define itself, it seemed like the nineties was the decade of scepticism and cynicism. America spent most of the decade at peace, its forces deployed in peace-keeping conflicts half-the-world away. As such, the nation’s mind was allowed to wander. It could engage with issues like terrorism and freedom fighting in a more academic way, divorced from the siege mentality that often overwhelms those nations living in fear of that sort of violence. Terrorism bubbled at the edge of the national consciousness in the nineties. It didn’t dominate in the way that it did following 9/11, but it was definitely food for thought. Does he think the colonists are gul-ible? For example, the Palestinian organisation Hamas was officially identified as a terrorist group by the US State Department in 1993, following its first suicide bombing in April of that year. However, there was some measure of debate on the subject – the first draft of the Congressional Research Service was titled “Hamas: Freedom Fighters or Terrorists?” Abdul Rahman Al-Amoudi was able to present himself as a moderate to the public, and even served as an Islamic advisor to President Bill Clinton, but would proclaim support for Hezbollah and Hamas at rallies. He would plead guilty to attempting to assassinate Saudi Crown Prince Abdullah Bin Abdul-Aziz in 2004. Similarly, Clinton would generate controversy by allowing senior Irish Republican Army figures to fund-raise in the United States in 1995. Of course, this came in the lead-up to the Good Friday Agreement and Clinton’s involvement in the Northern Irish Peace Process. It ignores the long history of Republican groups secretly fund-raising in the United States. The American fixation with international terrorism played out in the decade’s blockbusters. The 1997 remake of The Jackal featured Richard Gere as an Irish terrorist. Tommy Lee Jones, Sean Bean and Brad Pitt all played Irish terrorists, while Islamic terrorists featured in films like The Siege, Executive Decision and True Lies. Terrorism by Federation colonists, however, also reflected the growing threat of domestic terrorism the United States experienced during the 1990s. By the time The Maquis was broadcast in 1994, Americans had witnessed bloody clashes between federal government officials and right-wing extremist groups. From the shoot-out between white supremacist Randy Weaver and the federal agents at Ruby Ridge in 1992 to the tragic conflict between the apocalyptic Branch Davidians and the Bureau of Alcohol, Tobacco, and Firearms the following year in Waco, Texas, the American public discovered firsthand the right-wing militia movement that had sufaced by the early 1990s. Like the Maquis, such extremist groups felt abandoned, if not threatned, by an expanding powerful federal government that to come seemed to have ceded American independence to a global New World Order best exemplified by the United Nations. So the notion of seeing fellow countrymen take up arms against the authorities was nothing new. The Maquis plays on this idea of disenfranchised and disillusioned people trying to make their stand against an authority they felt had betrayed their best interests. The natives are truly restless and rebellious in Star Trek: Voyager. As rebels, the Maquis are frankly indigenous Americans shown through tired, but effective stereotypes of the hot-blooded Latina and earthy Native-American crewmembers. The PC Trekkies prefer the superficial analysis of the Maquis as proxies for the Palestinian/Israeli conflict, but the clear stereotypes betray a more deep seeded sense of guilt and therefore projector of terror over the terms of the settlement of this land. This reading arguably makes more sense in the context of Journey’s End, featuring actual Native American characters who challenge Picard on his own historical involvement in the genocide of the Native American peoples, but it’s at play throughout the franchise. The most high-profile Maquis character (at least in theory) is Commander Chakotay, the franchise’s first Native American regular, albeit played by a Mexican-American performer. A Native American can be glimpsed among the settlers in The Maquis, Part I. It’s also worth noting that the franchise makes a point of casting minority actors as the more sympathetic Maquis members. B’Elanna Torres, in Voyager, is – according to Jeri Taylor’s Pathways – half-Mexican. Latino actor Tony Plana plays the most prominent settler here, and African-American Bernie Casey plays the first Starfleet defector to the cause. The fact that these are characters were cast using actors of various minorities feels rather pointed. Given the statistics concerning the median income of black or hispanic households compared to white households, or the per-capita rate of imprisonment among African Americans or Hispanic Americans as compared to that of whites, it seems like the Maquis have been rather consciously designed to reflect those frequently overlooked or ignored in contemporary American society. There’s a sense that these people really aren’t cut out to be terrorists. The first Maquis operative we wee is a middle-aged white guy who is balding. It’s suggested that at least part of Calvin Hudson’s justification for the joining the Maquis is to give him a sense of belonging following the death of his wife and his isolation from his friends. “When I heard about Gretchen, I wanted to be there for you,” Sisko assures him. 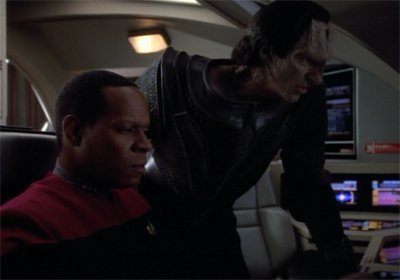 “There was just no way to get back.” Given that Sisko appears to be Hudson’s closest friend, it creates the impression of a man left alone to deal with his grief. “You can’t imagine how my life has changed since the Federation abandoned these colonies,” Cal remarks to Sisko, letting the conversation drift away from the massive loss he suffered at about the same time. With the death of his wife, a romantic rebellion gives Hudson’s life some sense of purpose. It allows him to fight the good fight. The show is never too overtly cynical in its characterisation of Calvin Hudson, but it’s suggested that part of him just wants to do something big and bold and meaningful – to fight “the good fight.” It’s a theme the show would return to more explicitly with the two other high-profile defectors from Starfleet over the show’s next two years. After all, it doesn’t seem like the Maquis really know what it is they are doing. Bill Samuels is caught by the Cardassians remarkably quickly. Sakonna makes the least subtle attempt to purchase illegal weapons in the history of Star Trek. 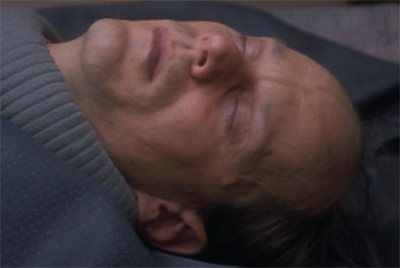 The group manage to kidnap Gul Dukat and smuggle him off the station – a coup so successful that they use it to announce their formation – but they can’t even hold on to him for too much of the show’s second episode. “You people really do not do this very well, do you?” he gets to taunt, offering pointers on enhanced interrogation. The Maquis are more of a reckless irritation than a genuine threat – their actions capable of sparking a war between two larger powers that are somewhat more efficient when it comes to violence and brutality. It is easy to buy into the romance of somebody fighting to protect their land and their home, but there’s also a sense that their world view is somewhat limited, and that they lack any real understanding of how the universe works. A deleted scene from the script hints at something Deep Space Nine would develop later on in its run, particularly concerning Sisko’s relationship with the Maquis. Sisko was something of a Federation cheerleader in these early episodes. 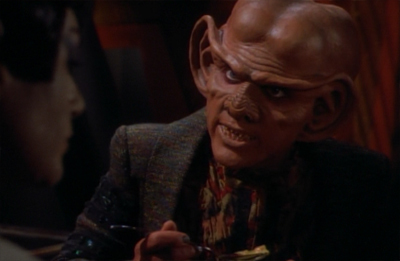 In the first season, he refused to let Jake play with Nog because of the Federation’s opinion of the Ferengi. In Blood Oath, he tried to shame Dax out of honouring her Klingon promise, by appealing to Federation values. On some level, the notion of people just “leaving” paradise rubs him the wrong way. Of course, the Maquis aren’t the only dysfunctional organisation on show here. 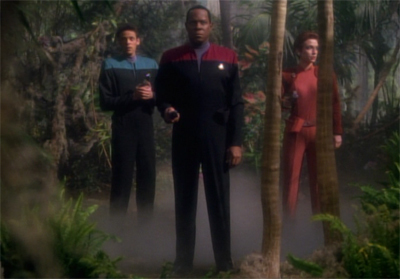 The Maquis, Part I makes a solid case for Deep Space Nine as the most dysfunctional of Star Trek shows. Depsite the wonderful “casual work gossip” scene between Dax and Kira in the teaser, there’s still tension. 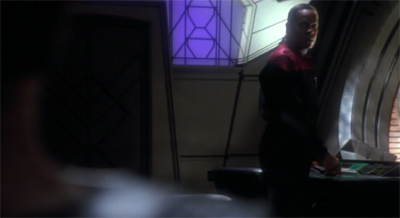 At one point, Sisko and Kira are having an argument so heated that he just opens the door to his office as a none-too-subtle way of telling her to get the hell out. During the senior staff’s big crisis meeting, immediately following the kidnapping of Gul Dukat, you’d expect the leads to come together and figure it all out; instead, they seem at each other’s throats. This is a nice little scene which actually says a lot. 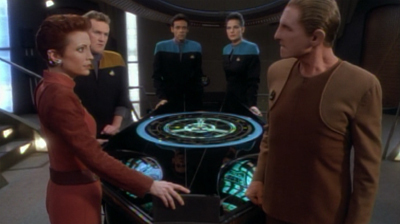 For one thing, the ensemble is so well developed that Odo can have an outburst like that both without seeming entirely out-of-character and without becoming completely unsympathetic. We might not agree with his philosophy, but we understand it. There’s also a clear sense of unease in the working relationships here. While The Next Generation felt like the most professional workplace in television, Deep Space Nine has a lot of friction that comes with an approach welcoming philosophical diversity. There’s also just a hint of nostalgia in Odo’s “it was safer then” comment. We tend to simplify the past when we talk about it – pretend that things were clearer and better than they are now. (For example, keeping with the themes of the episode, global terrorism is actually in decline, with the highest concentration of international terrorist attacks on the United States coming between 1987 and 1991, rather than in the past decade.) There’s a difference between the past we remember and the past that exists – a contrast between Dukat’s precise “photographic memory” and the human cast’s romantic nostalgia. 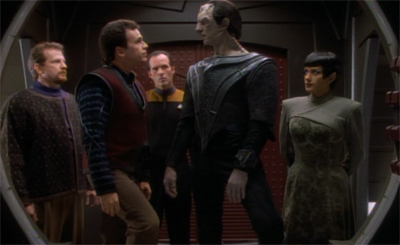 “It’s my job to convince you so you can clean your own house instead of forcing us to do it for you, which would certainly endanger the new treaty,” Dukat offers. Although there’s an implied threat in his statement, there’s also a sense that he has a point. 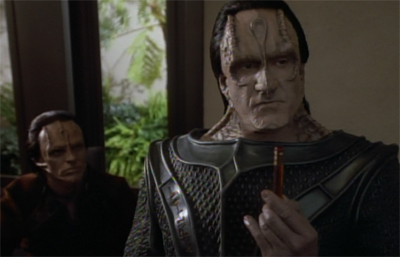 Of course, the Cardassians have their own dirty laundry, but The Maquis creates a situation where Dukat has to help guide Sisko to put his house in order. It’s a fairly nice idea – suggesting that the onus and responsibility for galactic peace does not rest solely with humans and that perhaps they aren’t inherently superior to the other species inhabiting the cosmos. 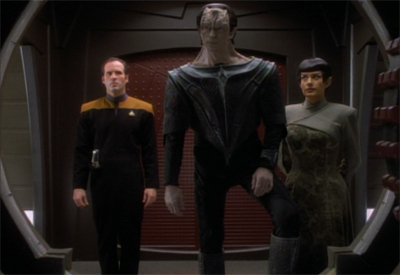 It also makes Dukat into a more developed and well-rounded figure. He’s no longer just a familiar vaguely adversarial figure from another power. He has evolved past a Cardassian version of Tomalak. Instead, he is a character with his own motivations, methods and objectives. 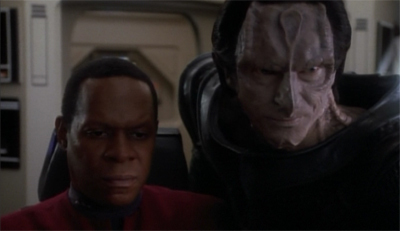 The Maquis makes it clear that Dukat has his own agenda and probably isn’t entirely trustworthy. 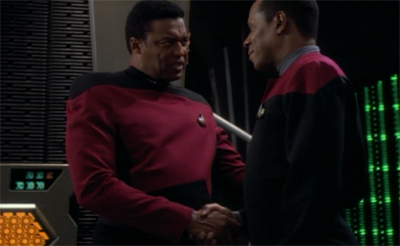 After all, this is a guy who surprises you by waiting for you in your quarters – I’m not surprised that Sisko felt the need to check up on Jake. To be fair, there’s relatively little of that left in the finished episode, but it does point to the show’s decidedly old-school frame of reference. It also cements the idea that Deep Space Nine really is a space western in a way that The Next Generation and Voyager really aren’t. The Maquis has a great little hook and premise. However, there are times when the episode feels a little too impersonal for its own good. While adding Sisko’s old friend (who we just met) Cal Hudson does give the conflict something of a personal dimension, the show often feels a little too detached for its own good. 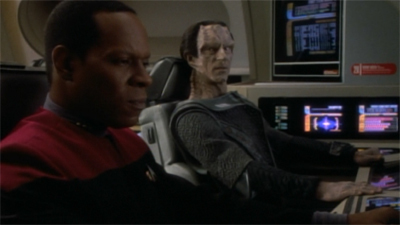 For example, a conflict between Federation and Cardassian rebels plays out entirely in dialogue in the cockpit of the runabout. I know the show has a limited effects budget, but even audio might have given the sequence a bit more weight, rather than having Avery Brooks and Marc Alaimo talk us through it. Still, it’s a very clever and very bold (and very Deep Space Nine) episode. Ironically, for a show that’s intended to set-up the upcoming Voyager, The Maquis feels like quintessential Deep Space Nine.